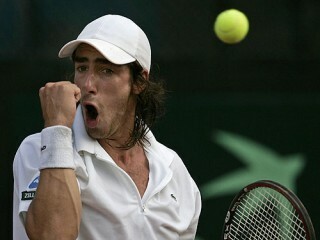 Pablo Cuevas is a Uruguayan professional tennis player. Cuevas won the 2008 French Open Men's Doubles title with Luis Horna. In February 2009, Cuevas reached the doubles ranking of No. 16 after winning the 2009 Movistar Open. He achieved his career-high singles ranking of No. 45 on October 12, 2009. At the 2009 Movistar Open in Viña del Mar Cuevas, as in 2008, he reached the semifinals in singles, where he met local favorite Fernando González. González won the match 6-3, 6-2. In doubles Cuevas paired with Argentinean Brian Dabul, and together they won the tournament, winning the final against František Čermák and Michal Mertiňák by 6-3, 6-3. This win helped Cuevas achieve his doubles ranking high of 17 in the world on February 9, 2009. In the first round at Wimbledon 2009, Cuevas defeated Christophe Rochus of Belgium in a come-from-behind victory, 3-6, 4-6, 6-4, 6-1, 11-9. In the second round he lost to 21-year-old Jesse Levine of the U.S. (who defeated Marat Safin in the first round) 6-2, 6-1, 4-6, 4-6, 6-3. Cuevas qualified into the 2009 International German Open. He reached the semifinals of that tournament by beating Björn Phau, 9th seeded Jürgen Melzer, 8th seeded Philipp Kohlschreiber, and 14th seeded Nicolás Almagro in the quarterfinals. He lost in his semifinal match with Paul-Henri Mathieu 6-4, 3-6, 5-7. Cuevas played in the 2009 Kremlin Cup as the #5 seed. He advanced to the quarterfinals by defeating Lu Yen-hsun and Teymuraz Gabashvili. He lost in the quarterfinals to Mikhail Kukushkin 6-4, 1-6, 4-6. He did, however, win the doubles title partnering with Marcel Granollers. He went 0-4 at the start of 2011, but when on arrival at the Sony Ericsson Open in Miami, he defeated both Michael Berrer and Andy Roddick by the same score, 6-4, 7-6 to reach the third round. He defeated third-seeded Jo-Wilfried Tsonga and sixth-seeded Thomaz Bellucci in consecutive matches to reach the semifinals of the 2011 Estoril Open. Coached by former ATP pro and Argentine native Daniel Orsanic (since March 2008).